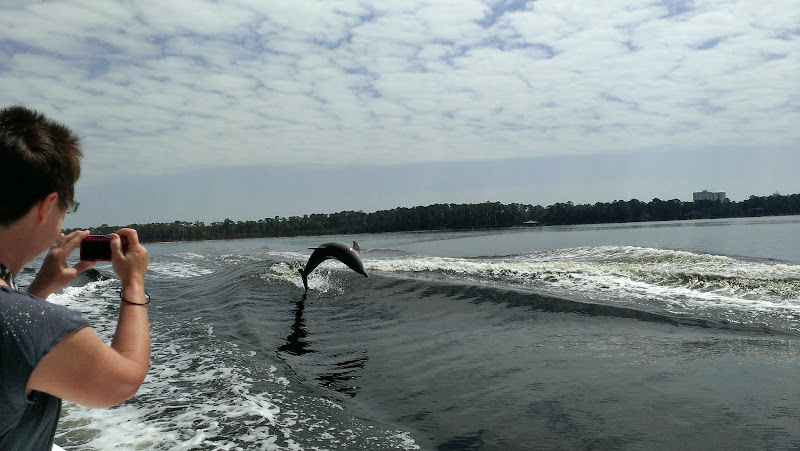 Home→Fun Stuff→Good Eats→Alabama→…Just Plain Ol’ Good Fun! …Just Plain Ol’ Good Fun! Now this was a really fun day! 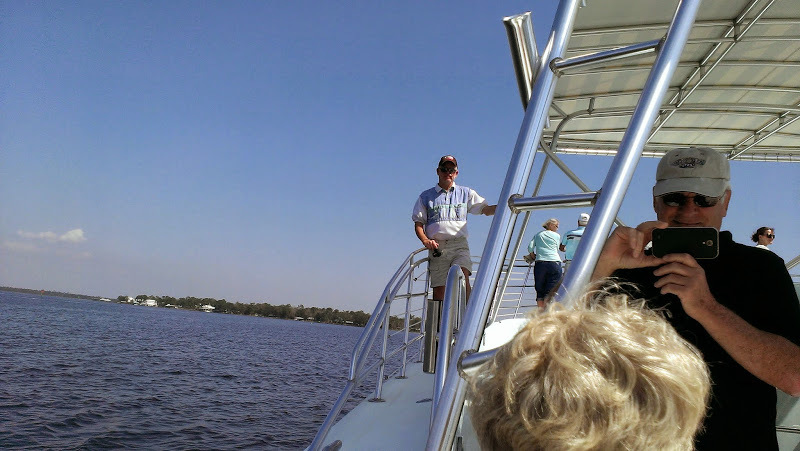 On Thursday, March 20th, Linda, Herb, Rob and I took a Cold Mil Fleet Dolphin Tour out of Orange Beach. This year it is $20/person (and still worth every penny) but we found a $2 coupon in one of the tourist books lowering the cost to $18 – the discount just about covers the taxes. Yes, I know those of you who have followed our blog site are saying “what again? Haven’t you taken this tour before?” Yes, we have! This is the third time for Rob and I (it was only $12/person in 2011), but we just never tire of watching these fun loving fellow mammals – it was just as thrilling the third time as it was the first. And yes we would do it again! 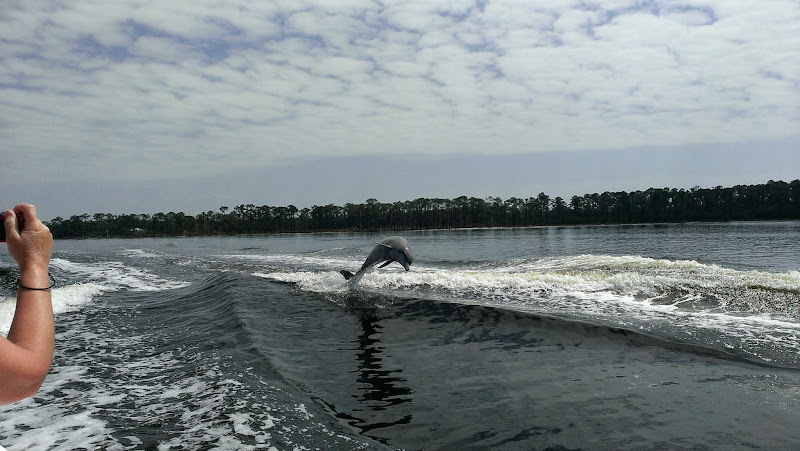 We have looked at other dolphin tours in the area and although we have not actually tried out the competition, from what we hear and have observed, if you want a fun experience watching some playful dolphins having fun themselves, then this is your best bet! The short video below will give you a good idea of what to expect. 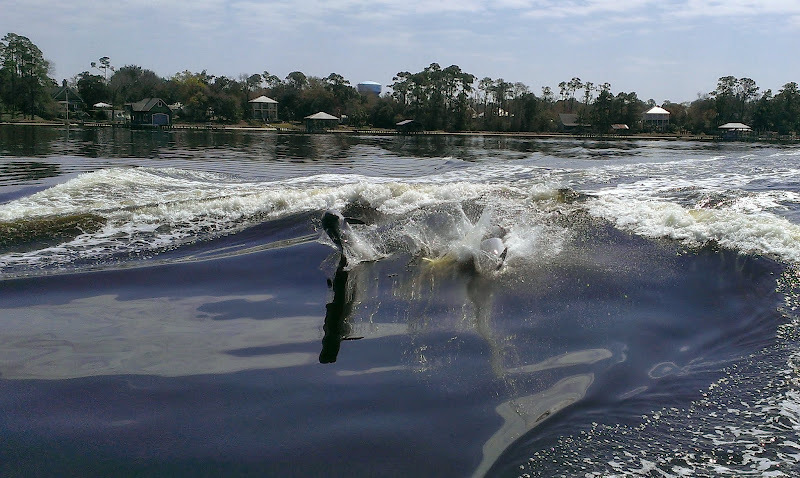 In our opinion what sets Cold Mil apart is the “two boat synchronized wake”. Two approx 50′, open air, single engine diesel, deep-V, planing hull type boats set up side by side about 40-50′ apart and accelerate together to a point just before “climbing out of the hole” or “getting on plane” – at this point the stern of the boat “digs in” and the wake is the biggest. 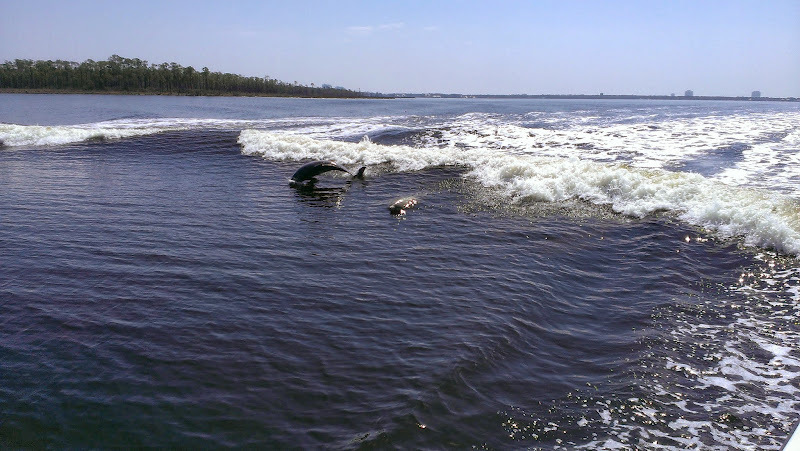 The two wakes from the two boats combine in the middle between them making an even bigger wave that is just irresistible to the surf and jump loving dolphins, this is shown in the video below. 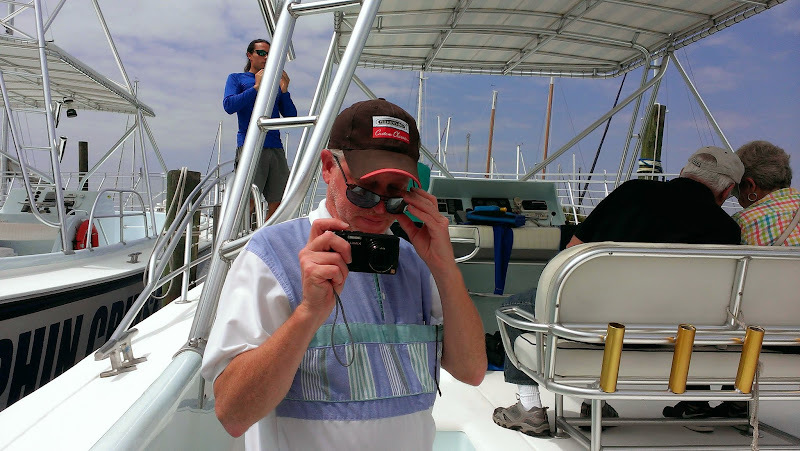 I do remember though, on our first trip in 2011 only one boat went out due to a smaller crowd, but we still saw plenty of dolphins. Heck, $20 is a deal just for a cruise out on the bay on a nice day! 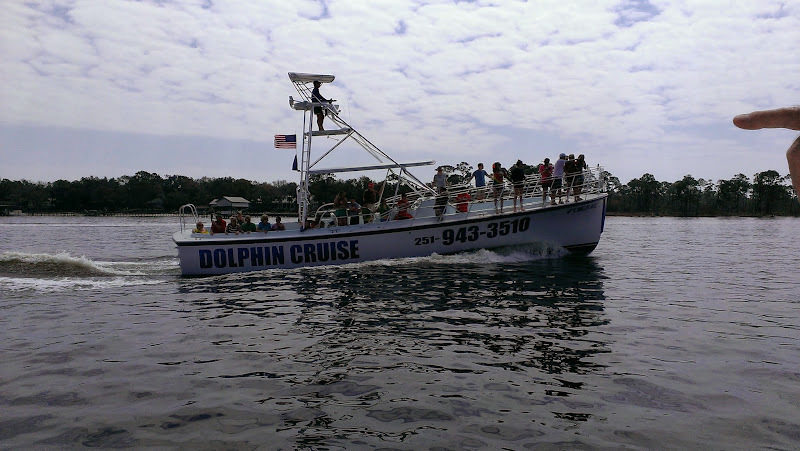 A little inside info: Most newbie’s to the tour will scramble up forward and stand by the bow rail during the trip out of the marina figuring that’s where the best view will be, but take it from a frequent visitor – while the bow makes a nice high perch for spotting distant dolphins, the best view of the jumping dolphins will be had from amid ships and points aft! 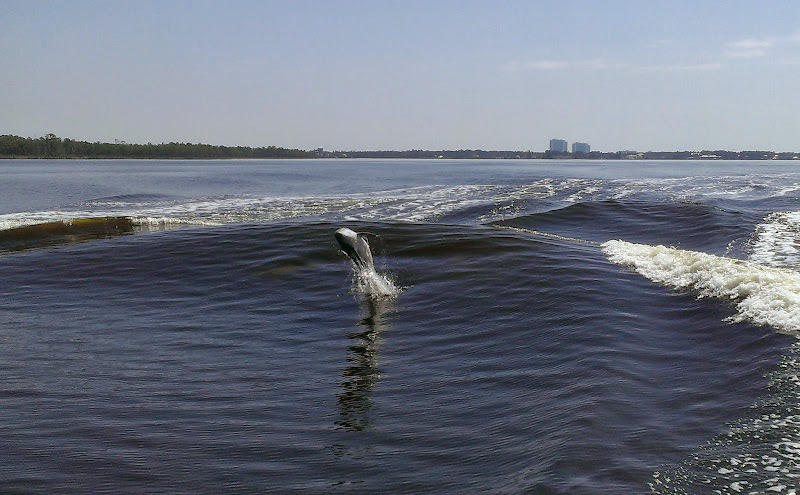 Remember the dolphins are surfing the wake which is just behind the boat. 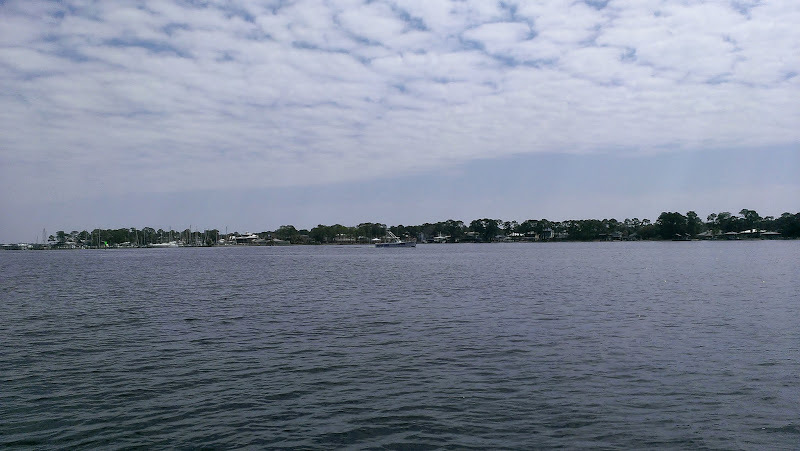 All the trips with Cold Mil Fleet we have been on were always within the protected waters of Arnica Bay/Bay La Launch/Wolf Bay, so on a typical day the water is calm and seasickness is not a worry for most people. I suspect on extremely windy days they will not run the tour, so make sure you pick a nice day! The trip lasts about 1.5 hours and yes there is a head (toilet) on board. Iced water and drinks are sold for $1 on board too. Plenty of free parking is available across the street from the marina. Reservations are recommended, but you don’t need to pay until you arrive on site. 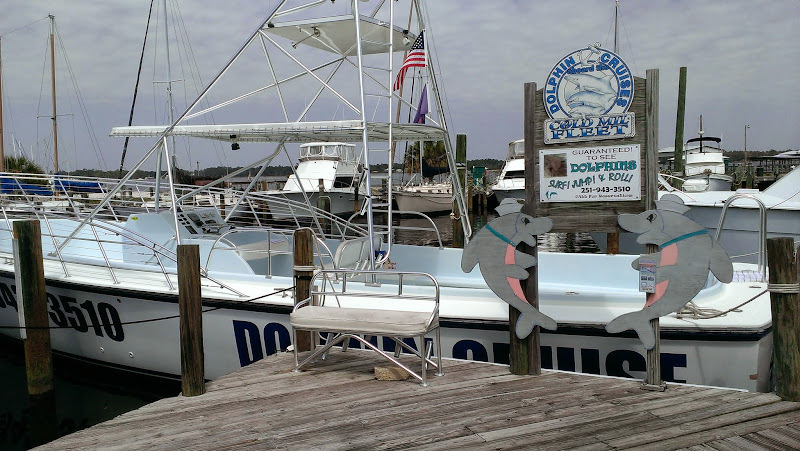 On your return to the marina if you are hungry you will find Flipper’s Seafood and Oyster Bar restaurant serves a decent lunch and you will get a coupon with your tour ticket for some free ice cream. 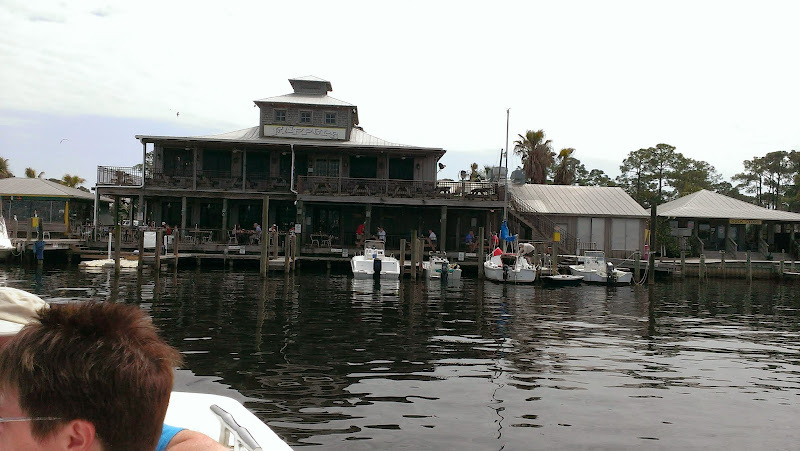 However, for a small up-charge, Shipps Harbor Grill just down the road (and on your way home), offers (in our opinion) superior fare, particularly at lunch time prices (try their Grouper Pontchartrain which we wrote about in our last post!) . Enough said, the photos and videos will speak for themselves. 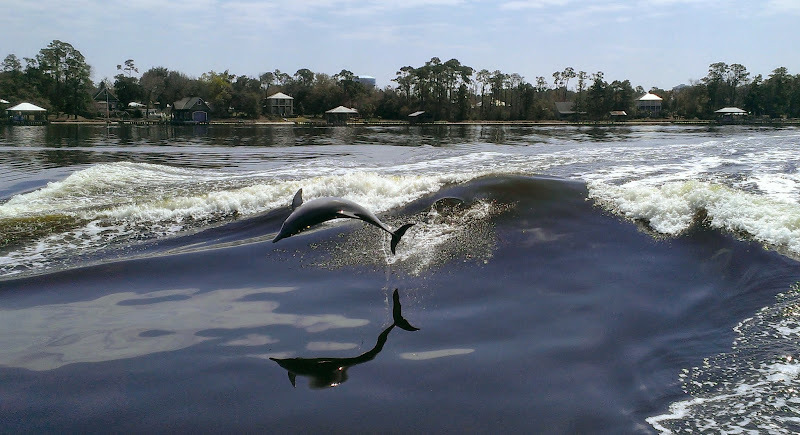 The Dolphin pictures are great.